AGAR MALWA: Two persons have been booked under the stringent National Security Act (NSA) in Madhya Pradesh for alleged involvement in cow trafficking. The action has been taken in Agar Malwa district in Western part of the State. The duo--Mahboob Khan and Rod Mal Malviya have been booked uner the Act. According to police, NSA was invoked against the two persons and they were later sent to Ujjain jail. This incident has come close on the heels of the similar action when the same law was used to incarcerate people suspected of involvement in cowslaughter in Khandwa. 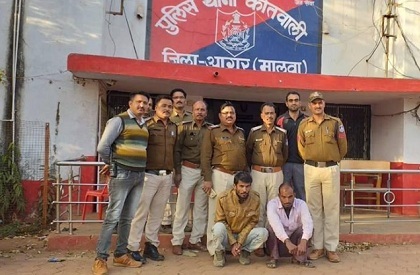 An official statement of the police said that on the directions of the district collector Ajay Gupta, two persons were booked for transportation of bovines. It also mentions that these people have been involved in bovine transportation and cases were registered against them earlier too. Also, it says that carrying bovines in the loading vehicle had caused tension. Hence, police have taken the action under the NSA. While Mehboob hails from Ujjain, Rodu Mal Malviya hails from Agar. Both have been sent to the Central Jail. Senior journalist Jaffer Multani covers the region of Malwa, particularly, Shajpur and Agar Malwa districts.